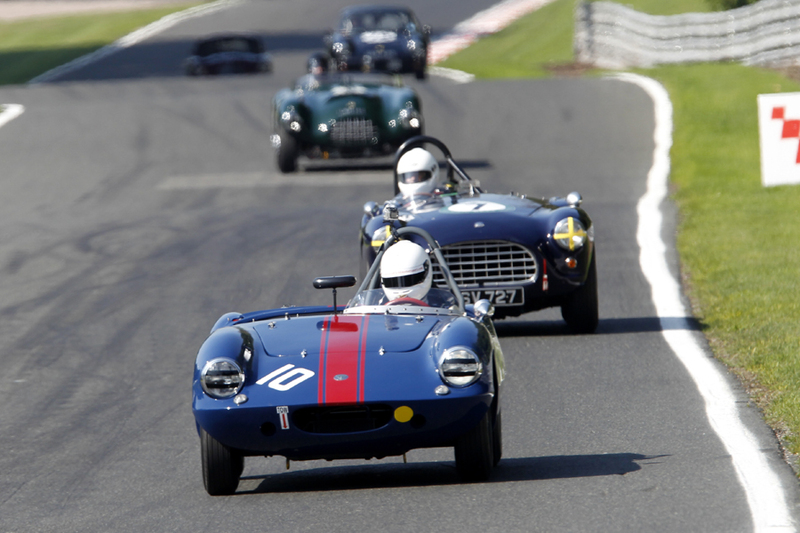 The Oulton Park Gold Cup is steeped in history, once a non-championship Formula One race from the days when the F1 drivers would be out in several races in various cars including Lotus Cortinas and the like as well as the F1 race. The HSCC has resurrected the event within the last decade which is now the premier historic meeting of the north, spread over the three days of the August Bank Holiday and packing in 20 races, quite something! FISCAR was privileged to be invited and this was testimony to last year’s good showing throughout the season. The FISCAR cars were a perfect fit for the event and one of the races had to be last on the list, shame it was us. That said it was a terrific day at a hot and sunny Oulton Park and it was going to be a long Monday for all. Rather like at Castle Combe, Oulton Park always attracts a good crowd and this being the big meeting was better than most. Jon Abecassis commented “an amazing feeling coming around Old Hall and seeing all the crowds on the banks on both sides” which always spurs you on, but can also sometimes encourage the red mist…. Despite being the last race on, it was encouraging to see so many spectators wait for the last (best?) grid to perform. 15 mins practice gave about 6 or 7 laps so with an out lap not that much time to get your eye in, especially if you don’t know the circuit. Two Elites hotly pursued by a welcome little bulldog puppy of James Hadfield / Ben Mitchell in the Elva Courier, a rare sight, but one of our original Donington Autosport test cars from 2012, so long overdue to present itself in one of our races and fully in-keeping with the essence of FISCAR. We had expected Simon and Amanda Hadfield in this car but the clue was in the sign writing on the side of the Courier which read "Owned and loaned by Amanda Hadfield". Nevertheless it proved to be a rapid challenger to the Elites of Arculus and Bancroft up front. On loan from Mum, and quick, the Elva Courier driven by son, James Hadfield, sharing with Ben Mitchell. Series regulars Andy Shepherd and Jon Abecassis followed up within 0.2s of one another, trouble brewing here……… Geoff Ottley was next up in 6th on the grid; he had driven the lovely red XK 120 up from Dorset. Geoff doesn’t do trailers unless a wheel falls off, and then he borrows mine! Jim Campbell put in an impressive time of 2 mins 20s hotly pursued by the MGA twin cam of Mark Daniell, the Elites of Freeman & Hilbery (off day John?) and then Tim Stamper’s DB2/4 all within a second! Charles Fripp brought out something interesting which attracted much attention. A lovely period body by Maurice Gomm that used to reside on an Alta GP chassis was planted on an XK 140 chassis. Apparently the original Alta went back to being a GP car and Charles bought the body a few years back. He eventually worked out that dimensionally it would go onto a XK chassis and this weekend was its first outing on the track. Good effort! 19 cars on the grid, with seven marques occupying the top eight spots on the grid, and quite unusually every car on the grid was British on this occasion. Given that there were 20 races in the meeting, not surprisingly,. things were running a bit late come the last one, some 10 mins or so, which meant that the 6.30 pm curfew would be a threat but we just scraped in with a couple of minutes to spare. By the race start Jim Campbell thought that he was more ready for a nap than a thrash around Oulton Park, but stayed awake nevertheless for the 30 mins race. 1955 Maurice Gomm body on 1955 XK140 chassis and running gear = Gomm Jaguar Special. Driven by Charles Fripp. The starter was clearly in a hurry to get the race going and the lights went out after about 2 seconds. Brian Arculus on pole commented “that was the fastest I've ever seen” which he says caught him napping. Usually I believe he’s tuning his radio off the start, but this time he was caught out good and proper allowing “smokey Joe” Bancroft to sneak into lead off the line in the identical Elite. The first lap looked a bit fraught, especially in the pack through the first few corners, some tail wagging tank slappers included. Contact was avoided thankfully and all got through OK.
Rare to see Brian Arculus headed, particularly by another Elite, but then Nigel Bancroft is a very quick driver. Unfortunately for Nigel, a smokey demise led to the resumation of normal service! Just behind the lightweights, Jon Abecassis (Healey) got a solid start having seemingly sorted his recent fuel vapourisation issues and managed to take the Elva in the run down to Cascades to be hot on Andy Shepherd’s heels (AC Ace) for the rest of lap 1. A good run up the hill out of Lodge allowed Jon to pass Andy on the straight but at the cost of entry speed into Old Hall, allowing Andy to retake third, followed shortly by the Elva who subsequently ran away from both the AC and the Healey. Bancroft's Elite was initially spraying water and on lap 2 started to generate an intermittent smoke screen from the exhausts. His pit crew put a board out for him at the end of lap 3 to come in, race over. 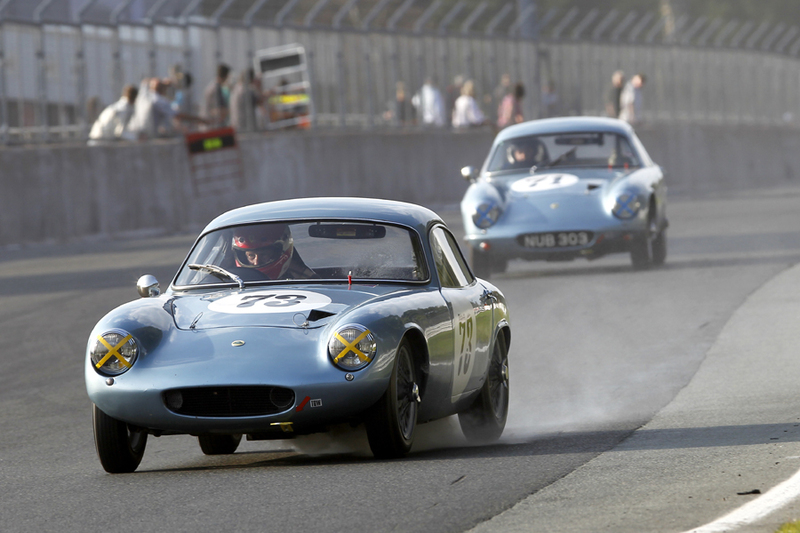 The Shepherd Ace and the Abecassis Healey were at it hammer and tongs all race. This was resolved in favour of Andy Shepherd after Jonathan spun toward the closing laps. “I overcooked it at Knickerbrook on my in-lap and the resulting pirouette left Andy a few seconds ahead coming out of the pits. I managed to claw him back and get in front on the run down to Knickerbrook but was overeager on the brakes trying to regain the place and spun again letting him straight back.” Andy made that one stick, with a big grin over the line I expect. Andy Shepherd (Ac Ace) won this encounter as Jonathan Abecassis (Healey 100) preferred indulging in pirouettes! The track got very slippery at various different places, and seemingly at different times, but could possibly be explained by some fluid being released by the Gomm Special throwing an additional challenge out there for drivers and flag marshals alike. Mark Campbell complained of losing power during the race, Tim Stamper lost his electrics and unfortunately retired, but the little Elva did extremely well with James and Ben taking a fine second place behind Brian Arculus. The team prize calculations resulted in a dead heat, so it was decided in favour of highest finisher, Brian’s Lotus. Second place was described to me as “an extremely bling trophy for 2nd team prize thanks to ‘ringer’ John Tewson in the one litre sprite holding his great qualifying place to bag the British Bulldogs some essential points”. Well done John for pulling that one off, especially after a late spin. Abingdons finest! Roger Daniell's ex works twin cam MGA leads Shaun Bromley. 50% of the FISCAR committee - albeit Richard Bell is no longer able to pilot his own grey DB 2/4 Jim Campbell and Tim Stamperl ( driver) in their Aston Martins. Tailpiece, literally! - Geoff Ottley in his Jaguar XK120 on his way to 5th, having driven it up from Dorset. Magnificent effort!